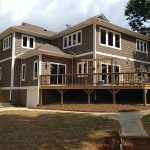 We can make your dreams a reality with our backyard design services in Davidson, NC. Backyard Design in Davidson – Imagine spending long afternoons swimming with your children in your pool and relaxing with friends in your outdoor kitchen. At Chad Goodin Signature Homes, we can make your dreams come true with our backyard design services in Davidson, North Carolina. When you take advantage of our backyard design services, there’s almost nothing we can’t do. Whether you want to have an outdoor kitchen installed near your patio or want to add an element of luxury to your outdoor living space with a water feature, we’re confident that we can complete the job with the attention to detail you deserve. If you decide that you want a pool put in, you’ll receive the same great service that we’re known for from our sister company, Lake Norman Signature Pools. To effectively capture the vision you have for your backyard, there are several things we will do during the backyard design process. For example, when we get started, we will have you introduce us to your ideas for what you want us to do in your backyard. Then, we will develop design plans for you and present them to you in a timely manner. If you have any suggestions for us or want to use a strategy that would more effectively meet your needs, we are more than happy to implement them. From concept to conclusion, we will not only meet your expectations, but exceed them. Get the backyard design you’ve always wanted by turning to us at Chad Goodin Signature Homes. We look forward to working with you and transforming your backyard into a beautiful outdoor living space that you can enjoy for many years to come. At Chad Goodin Signature Homes, we provide high-quality backyard design services in Davidson, Mooresville, Cornelius, Huntersville and the surrounding Lake Norman area of North Carolina.